It's a Great British Menu this month - and entertainment too! 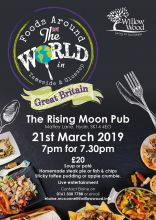 This month our culinary cruise is docking back home, with a Great British menu served up at the newly refurbished Rising Moon in Hyde. There's a choice for all three courses, soup or pate to start, homemade steak pie or fish and chips for the main course and sticky toffee pudding or apple crumble for dessert. Talk about being spoilt for choice! There's even live entertainment as the lovely Macy will be singing for her supper! Starting at 7pm for 7.30pm on Thursday 21 March, it's great value at just £20. Book your places online now or contact Elaine on 0161 330 7788 or elaine.mcconnell@willowwood.info.